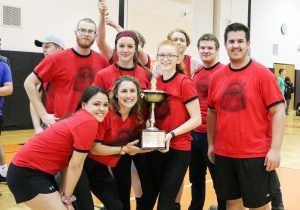 Members of the John C. Birdlebough Class of 2019 are all smiles as they pose with the championship trophy they earned in this year’s Battle of the Classes. The annual battle is the culminating event in a yearlong quest for spirit points. Throughout the school year, freshmen, sophomores, juniors and seniors participate in various community service activities to earn points for their respective class. Those points serve as the initial score for each team in the Battle of the Classes, with teams earning additional points in every mini-game and competition. Senior Gianna DeRoberts dives under an obstacle during the recent Battle of the Classes at John C. Birdlebough High School. 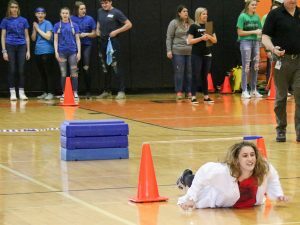 At the start of this year’s battle in the gymnasium, the class of 2019 had the lead and never looked back. The senior team, comprised of Ethan Hunt, Eric Betts, Cole LaPine, Marcus Berube, Kearra Backus, Erika Brown, Katie Kimball and Gianna DeRoberts, out-dueled the sophomore class in the Tug-of-War for the title of champion.